So we're going really raw here. This is what she looks like most of the time. I just want to remember this when she's older and all my future kiddos are sitting around the dinner table asking me what kind of babies and kids they were. When Lyla asks, I'll have these photos to jog my memory. I'll be perfectly honest and say "you were the cutest, tallest, skinniest cry baby ever.' And then she'll hate me forever and be in counseling for the rest of her life and blame her childhood for all her future problems. Thats my future. The blamed one. Oh to be me. Maybe I really am the worst mom ever, cause I started "sleep training" yesterday. I honestly thought I'd never say those words. You never know what you will do when your a mom until you are one. I naively thought that my baby would create natural patterns over time and I would work with those patterns to create a schedule for her. Well four months later, here we are and she has no semblance of a schedule other than that she doesn't nap consistently, and when she does nap its usually when I am holding her, and not for more than about 30 mins, maybe an hour if we're on an exceptionally good day, and then that would probably be her only nap of the day. She wakes up every 2-3 hours at night and goes to bed really around 11-12. There may be a reason she wakes up so much, partially, at least. She may be four months old and 25 1/4 inches long, but she only weighs 11.5 pounds. (Meaning in the last two months she has only gained 11 ounces.) I chalk it up to all the sit ups and leg contractions she does all day -seriously- she is the buffest baby ever, and then add all the screaming into and she's got one rocking core, let me tell you. Anyways, point is, she's got to be hungry. BUT- she slept for 7 hour stretches from about 6-8 weeks. 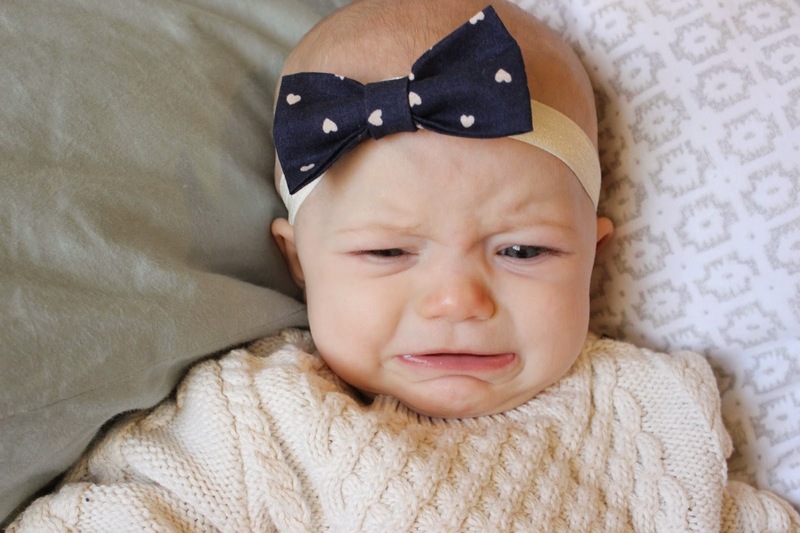 It wasn't util 2 months that she turned into this cry fest, albeit the cutest little cry fest ever. And I know its because she is beyond sleep deprived. So I've been reading The Sleep Sense Program. And it does make a lot of sense. So I'm trying it. I feel like a jerk doing it to her cause she hates it and so do I, although its only been in effect one day. So for your enjoyment, I'll show you how last night and this morning went. I had a relief society presidency meeting, so Kelly was in charge of bedtime routine, lucky him! She woke up at 12:30 at which point I decided sleep training was too hard and brought her into the bassinet in my room and gave her the pacifier. She continued to wake up with an absolute terror scream about every 5 minutes when her paci fell out of her mouth. At 1:50am I decided sleep training was totally worth it in the long run and took her back to her room and soothed her, and put her back in her crib without her paci and still awake. She screamed. A lot. I sat and rested in the chair in her room, getting up every few minutes to soothe and comfort her. At about 3am she fell asleep. I went to bed -yay! She awoke at 6:15am and I fed her, then returned her to her crib, still awake. She fell asleep pretty fast this time, just a few minutes. She awoke at 7:44, at which point I wasn't sure if she thought it was morning or not, so I got her and brought her to my bed. She fell asleep. I returned her to her crib at about 8:20 and she woke up. She cried, but I'm honestly not sure how long because...I fell asleep. Ya I'm an awesome mom, see? She awoke at 10:15 - happy! and playful! Then at noon she turned into a terror again so I put her in her crib. She screamed. duh. For twenty minutes, then slept. And that brings us to now. She's sleeping. So obviosuly I'm also the worst sleep trainer and mom ever cause in the middle of the night in my sleep depraved state I can't even decide if its worth it and then change my mind ten times.....fabulous. 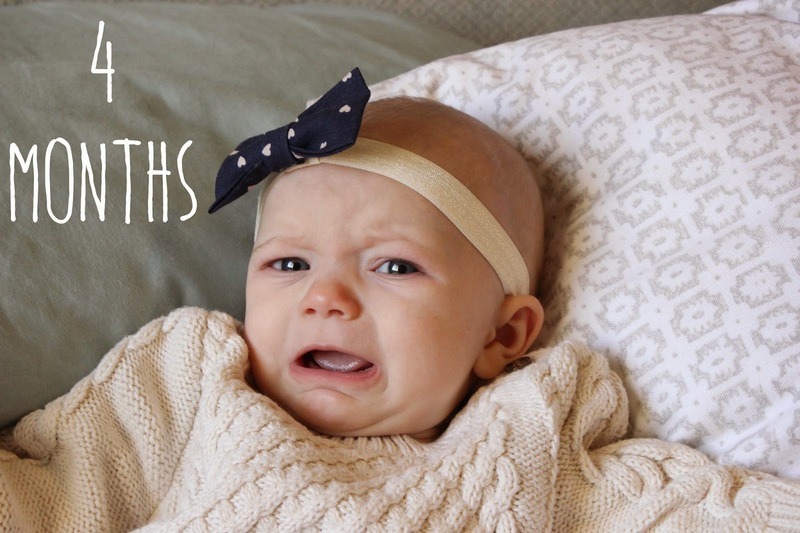 Plus, I feel like I'm just using the cry it out method.....even though I am establishing a night time routine and trying to teach her good sleep habits for the future, like how to self soothe, and I go in and pick her up occasionally, and talk to her, etc. but man oh man its the hardest thing ever! Anyways. Thats my life currently. And Lyla's. She's 4 months old, yay! Now, to show you some things we actually love about Lyla May! 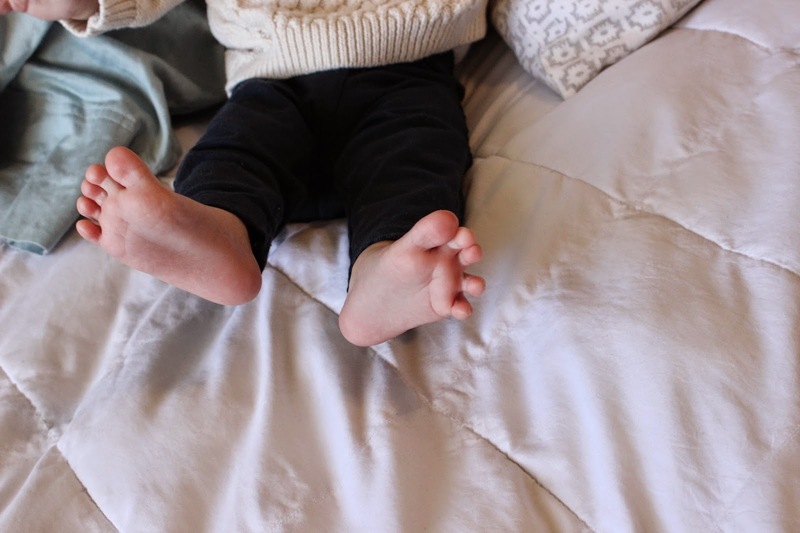 -She's started grabbing her feet and toes and playing with them. -She tried rice cereal on Monday, and loved it! Except we had to give it to her through a syringe because she's not yet into the whole spoon thing. -She gets these huge explosive smiles and giggles for mom. They are the best. -She likes to play in the mirror with mom. -She definitely knows who I am and has a preference for me. -She' started using toys, grasping and sucking on them and staring at them. Its adorable. 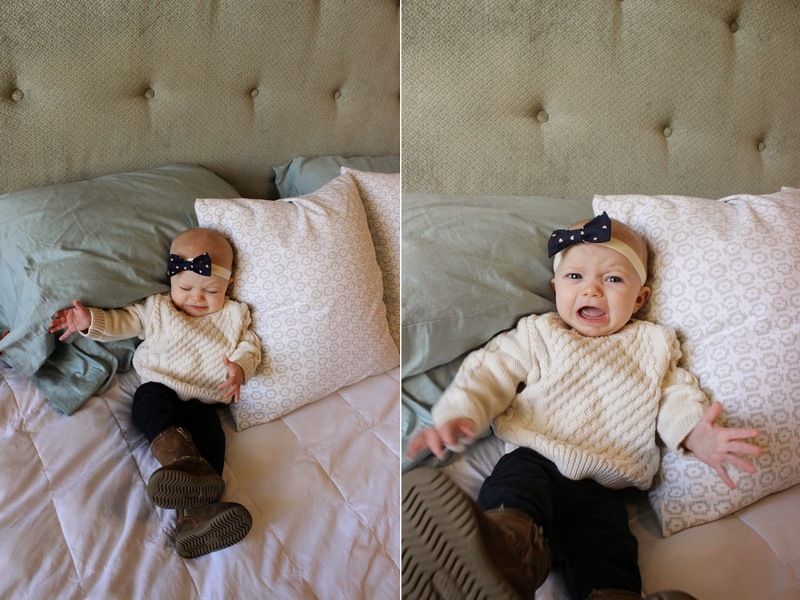 -She's obsessed with kicking. Its constant. And got to be quite the work out. -When she's on her tummy she can kind of scoot around, but she does it mostly on my tummy or in her crib. -She's a roller!! 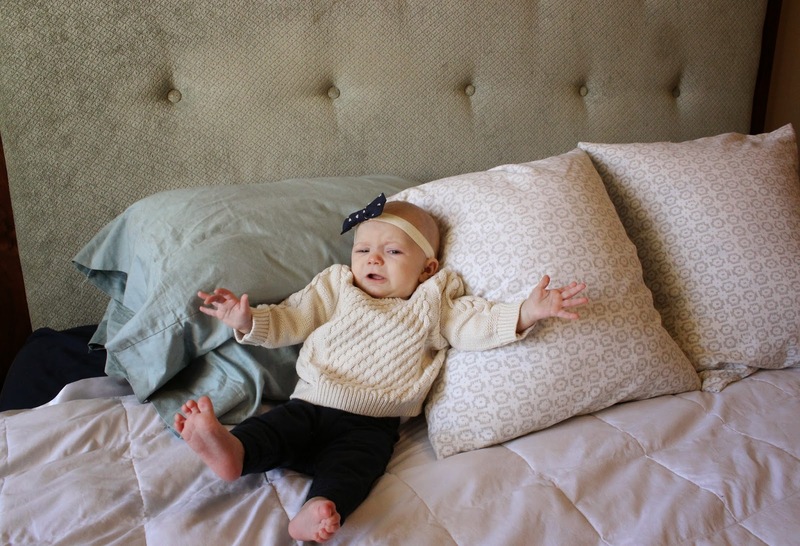 She does it mostly when she is mad...like when I put her in her crib and she doesn't want to be there. Well that's us. Me learning slowly how to be a mom, and Lyla learning to adjust to life with me as her devil mom. Brilliant*. *I've been watching Harry Potter, so I had to throw that in there. How much are you feeding her at a time? Are you breast or bottle feeding? She might be crying so much because she's hungry. I feed Grayson on demand (basically every 2 hours, sometimes even an hour and a half) throughout the day and it helps him sleep longer at night. She's still super young so when she cries I would just try to feed her. She will (hopefully) sleep better on a full stomach. Just suggestions because obviously I don't know exactly what you'd tried!! Hey Tiahna! Not sure if you remember me- we met up at Ben and Rachel's cabin in Salmon. Anyways, we have a little girl a few months older than yours, and she's a difficult sleeper also. One thing that worked for us was swaddling - i swaddled Addy until she was about 9 or 10 months, and it made a huge difference. I also have recently started using essential oils and making a 'sleep' cream' to put on her feet before bed. Im still nursing her so she's up every few hours to eat, but she falls back asleep right away. All babies are different, but maybe worth a try?